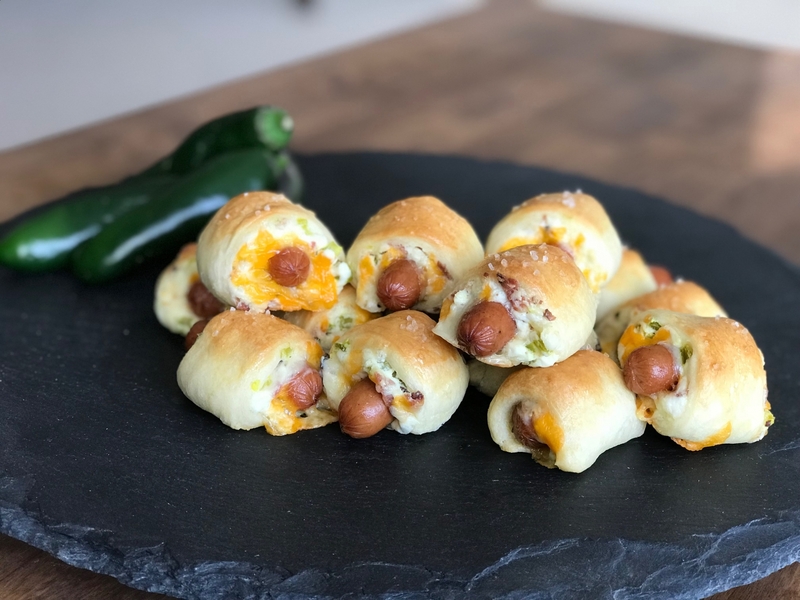 If a jalapeno popper and a pig in a blanket had a baby, this would be it. Drain and finely chop the jalapenos. Combine cream cheese, jalapenos, and bacon in a small bowl. Unroll the crescent dough and spread the cream cheese mixture over the entire dough surface. Sprinkle grated cheese on top. Slice the dough (a pizza cutter works well) into about 1″ strips then cut those strips into thirds. Working one at a time, add one sausage link to the cut strip and roll, pressing to seal them. Transfer to the baking sheet seam side down. Continue until they are all rolled. Prepare the egg wash by whisking the egg and 2 Tbsp water together. Lightly brush the top and sides of each popper then sprinkle with a little coarse salt. Bake 15-18 minutes or until golden brown. Serve warm.